Rent the Jacuzzi suite for extra classy digs. A water slide and fountains are great fun for kids of all ages. The beach is only a few steps from your rental. On a hot day there's nothing like relaxing with a refreshing cocktail or iced tea. They've got ping pong, shuffle board, giant checkers and more. Challenge your kids in the old-school arcade. On the north end of Myrtle Beach, you're away from the crowds. Relax as you float along the indoor lazy river. There are water slides, several pools, and a kids play area. Don't let the weather stop you from going for a swim – there's an indoor pool. Enjoy a drink by the pool at Banana Boat Lounge. The beachfront Ocean Reef Resort is located in the heart of Myrtle Beach within five miles of the area’s best attractions. Get your day off to a good start at the breakfast buffet in the oceanfront restaurant. When you get back to your condo, get changed into swimsuits and slather everyone in SPF. Go for a swim in the outdoor pool or lounge on the pool deck with a cocktail from the poolside bar and the latest issue of People magazine while the little ones splash around in the outdoor children’s pool. The kid’s water park with waterslide and splash zone is sure to be a big hit. If the weather isn’t cooperating, there is also an indoor pool and children’s pool. The glass-enclosed lazy river and two hot tubs are perfect for relaxing. Get your cardio on at the fitness center while the kids hang out in the game room or challenge the family to a game of sand volleyball. Efficiency Studio and Parlor condos sleep four guests. Kitchenettes have what you need to prepare the basics or heat up leftovers. Studio and one-bedroom condos sleep four to six guests. Studios and some one-bedroom condos have in-suite washer/dryers allowing you to save space in your suitcase (more room for souvenirs!) All studios and most one-bedrooms have full kitchens. Stock up on groceries at the on-site gift shop or the nearby Publix. Two- to four-bedroom condos sleep six to twelve guests and have enough space for the kids along with all of their blankets, toys and even a few imaginary friends. Get in touch with your inner-Betty Crocker and bake up a batch of your famous chocolate chip cookies in your full kitchen. You shouldn’t have any trouble persuading the little ones to assist – and make sure that the chocolate chip-to-cookie ratio is correct. If the kids end up with chocolate on their clothes, take advantage of your in-suite washer/dryer. Catch a sitcom rerun on the Flatscreen TV; it has Cable. DVD players are perfect for a low-key night in for family movie night. Bring favorite movies from home or browse the selection of free DVD rentals available at the resort. Broadway at the Beach is one of the most popular tourist destinations in Myrtle Beach. Need a new pair of shades? There are three Sunglass Hut locations. Surprise the kids with a visit to Build-a-Bear or Toys & Co. Make your own unique piece of jewelry at Pick a Pearl. Hungry? Joe’s Crab Shack, Hard Rock Cafe and Johnny Rockets are just a few of your options. Little ones will have a blast at the Children's Museum of South Carolina; it features interactive exhibits that allow children to use their imagination and learn at the same time. They can be a weatherperson or newscaster at the Weather Center and Continuous News Desk, a paleontologist at the South Carolina Fossil House or a contractor at the Under Construction House. Check out the 750,000-gallon shark tank at Ripley’s Aquarium or go on a glass-bottomed boat ride. Ripley’s Odditorium contains Robert Ripley’s (the creator of the “Believe It or Not” cartoons) personal collection of strange or unusual artifacts. See an authentic shrunken head, a 6-legged pig or check how you measure up to the world’s tallest man. 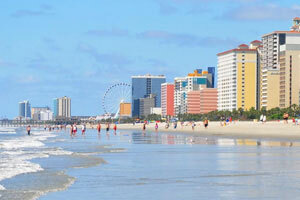 Do you want to experience the best views of Myrtle Beach? Go for a ride on the SkyWheel. It’s almost two-hundred feet high, and the climate-controlled gondolas provide a comfortable ride for everyone. No trailer, boat, or RV parking is available at this property.